When it comes to restaurants Berlin has plenty of great places to offer. Besides sushi. pizza, currywurst and kebab you can also visit many delicious burger-restaurants in Berlin. 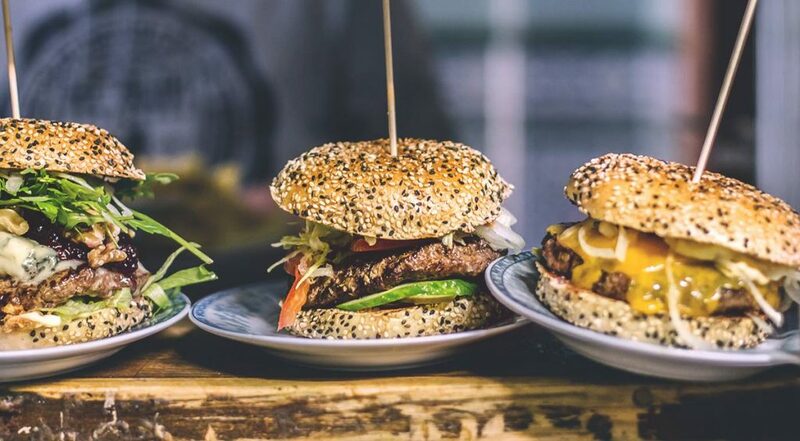 For this article we have been testing dozens of burgers over the last couple of months and now we can present you with the 11 best burgers in Berlin-Friedrichshain. Because of fastfood-chains like McDonalds and BurgerBurger King the hamburger has always been addressed as unhealthy and unsustainable. The fastfood-restaurants were the opposite of cosy soa you would only go there if you needed a quick bite. But the last couple of years there are plenty of alternatives if you want to enjoy a great hamburger or vegetarian burger. Especially in cities like Berlin, Hamburg and Munchen burger-restaurants are being opened by the dozen. These small and cosy restaurants often offer homemade burgers for a very competitive price and are giving the big chains a hard time. 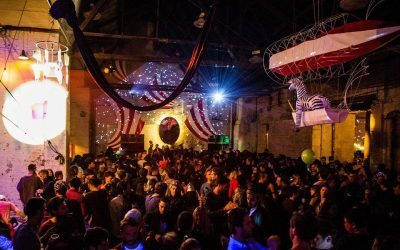 When it comes to music, clubs, food and sustainability Berlin is a trendsetter in the world. As mentioned above many burger-restaurants have been opened in Berlin in the last couple of years. As we speak there are more than hundred of these restaurants in Berlin. 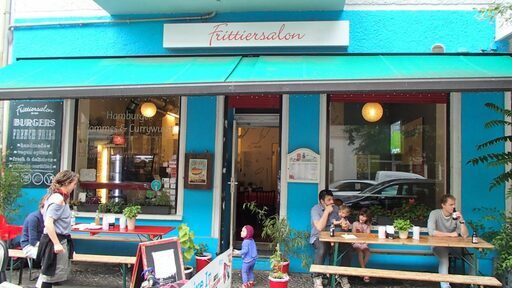 Because it is one of the most vibrant parts of town will focus on burgers in Berlin Friedrichshain in this article. Another positive trend in Berlin and the rest of the world are more aware of what they are eating. You see more and more sustainable restaurants and also vegetarian food is more popular than ever. Besides organic meat all of the burger-restaurants in this article offer vegetarian burgers. There are several ingredients which can be used as replacement for meat. On hamburgers tofu, halloumi, patatoe and even giant mushrooms are used. 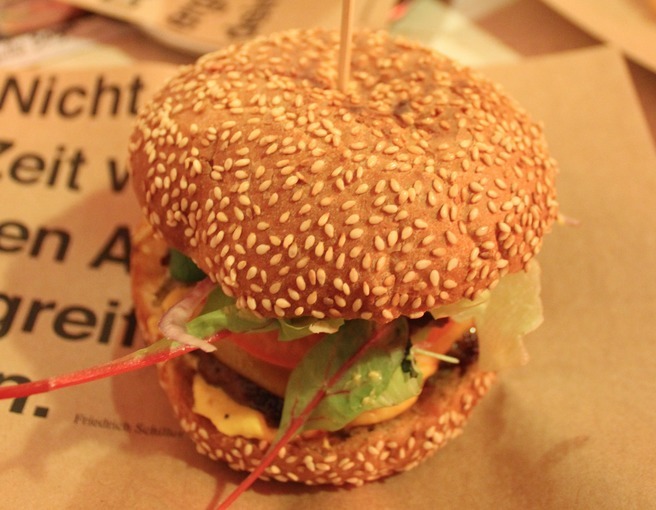 For this article we have been testing both meat-burgers as vegetarian burgers in Berlin. 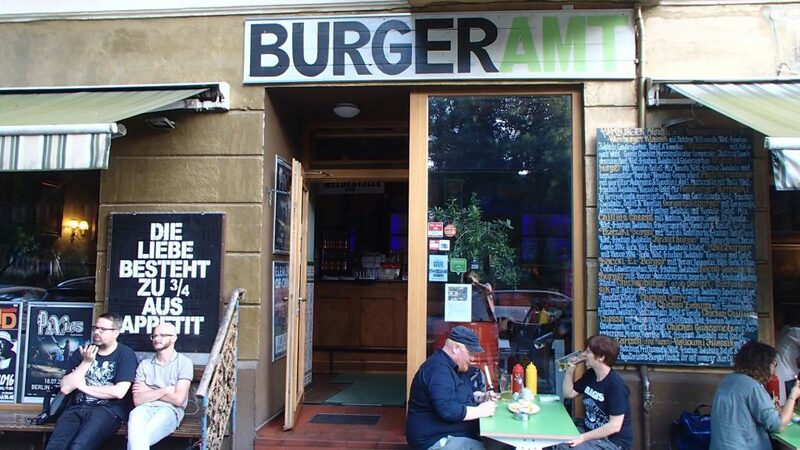 If you live in Berlin-Friedrichshain you probably heard of a place called Burgeramt. If you ask people for their favourite burger in Berlin, many people will mention this place. When we started writing this article we really wanted to have a surprising burger on the first place but we just have to admit that Burgeramt is awesome. 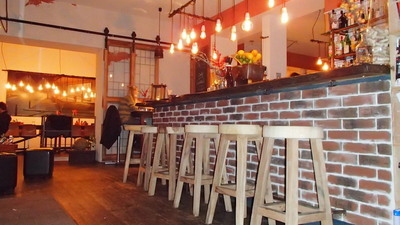 The restaurant is located directly at Boxhagener Platz and the interior is inspiring and fits to the city of Berlin. Another thing I personally love about Burgeramt is their creative menu. Not only the menu itself looks great, they also offer more than 20 different burgers: Besides the traditional hamburger you can get burgers like teriyaki, köfte, spicy chicken and many other surprising ingredients. A place as popular as Burgeramt could ask a lot for a hamburger if they want. But its great that the prices are still competitive and you get a normal hamburger for about 5 Euro. This is not that much more as a large burger in the Burger King so fair enough if you ask me. The fries of Burgeramt are not very special but with some sauce they will do the job. A last tip for the people who like special types of beer: Burgeramt sells homebrew beer. Vegetarian: Burgeramt also takes care of the vegetarian visitors. You can choose between 6 different vegetarian burgers with several main ingredients (Halloumi, Mushroom, Soya and more). Berlin-Enjoy Tip: Only order a large portion of fries if you are really hungry. You will get a ****load of fries so maybe just share a large portion if you are a normal eater like me. The Simon-Dach Straße is one of my favourite streets in Berlin. In the weekends it can be a bit too crowded but during the week it still has this great “Berliner-vibe” to it. Besides some laidback bars you can find about 5 different Berliner clubs around the corner in the Revaler Straße. The burgerplace called 5Places is located in this street and offers delicious burgers for a very reasonable price. The small imbiss offers homemade sauces and you can also create your personal dreamburger. The smaller burgers of 5places start at 3,80€ and the more impressive ones cost about double that price. An extra portion of fries can be bought for a humble extra 2€. The small place offers seats for about 10 people and has an additional two tables outside in front of the entrance. 5Places is definitely worth a visit because of their great burgers and great location. Vegatarian: There are two different veggie-burgers on the menu. The first is made with Halloumi an the second is a real veggie-burger. Obviously you can also create your own vegetarian burger. Berlin-Enjoy Tip: If you are very hungry you should try the Double Beef Burger. It is great. Besides that you should also try the homemade sauces. A Berliner Burger which is not officially located in Friedrichshain but can be reached within 10 minutes from the Warschauer Brucke, is Piri Piri Burger. The place is one of my favourites in Berlin so it had to be added to this list. The name might indicate that Piri Piri Burger only sells chicken-burgers, but they also offer the normal beefburgers. The meat of these burgers simply tastes fantastic and has a different substance than most burgers in this list (which is meant as a compliment). The best thing about these burgers is that the cheese is melted on top of the burger during the baking process, which gives you this crunchy cheese on top of your burger: I get appetite thinking about it. The burgers of Piri Piri Chicken are quite expensive, but still the place is very popular so that should tell you something about the quality of the food. The cheapest burger starts at 6,50€ and the larger ones go up to 14 Euro for a burger which most people will not be able to eat in one meal. 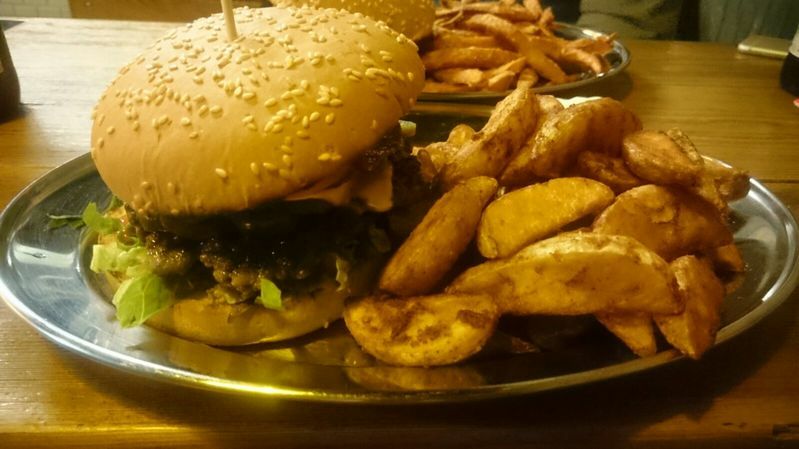 If it comes to the taste, Piri Piri deserves a spot in every list with the best burgers in Berlin. The restaurant/imbiss itself is quite simple but has space for about 15 people. By the way: In 2014 Piri Piri Chicken won an „award“ for having the best burger in Berlin. Vegetarian: Piri Piri Chicken is mainly focusing on meat but there are a few vegetarian burgers on the menu. These start at 5 euro and are all prepared with Tofu as a substitute for the meat. 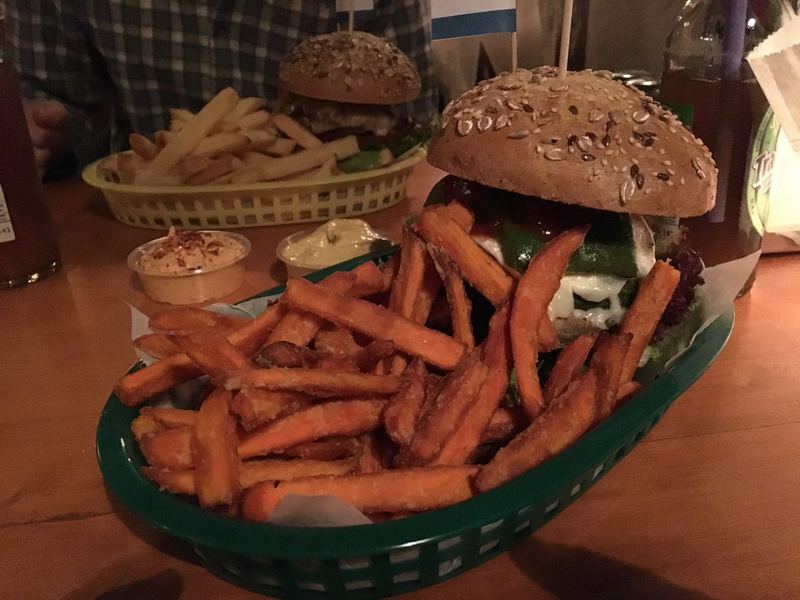 There are definitely burger-places in Berlin which sell better vegetarian burgers. 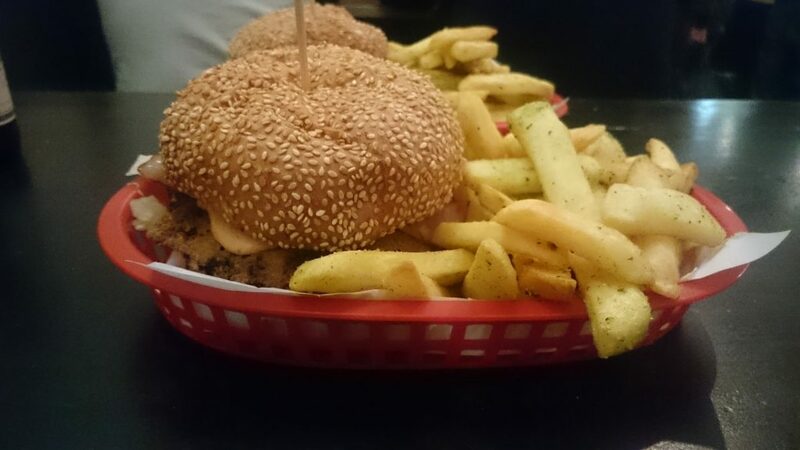 Our recommendation: Try the chicken burger as well, the place is not called Piri Piri Chicken for no reason. And if you want to save some money you should take a menu (extra fries and a drink for 3 euro). Schiller Burger is a burger-restaurant which can be found in Berlin on 9 different locations. The one in Friedrichshain is located in the Wühlischstraße so it is only 5 minutes walk from the Warschauer Brücke. Schiller Burger guarantees that the meat of the burgers is from German farmers and that the bread is freshly baked every morning. Although you might not expect it from a larger branch, the burgers of Schiller simply taste delicious. 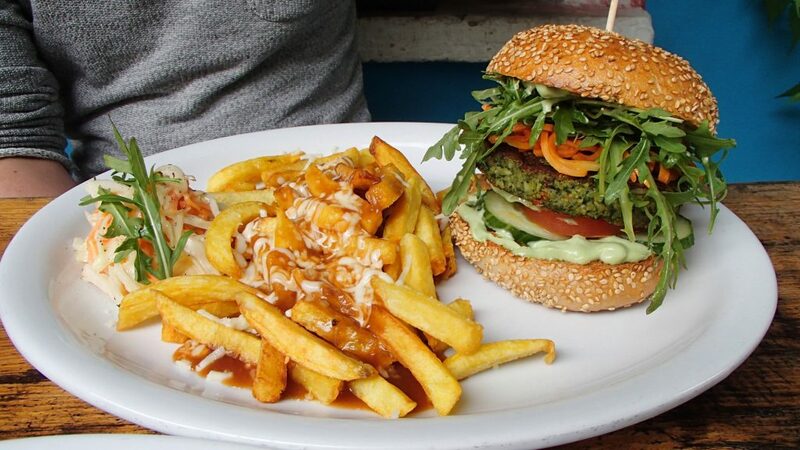 It was a very tight call between Schiller, Piri Piri and Burgeramt, but the vegetarian burgers and the fries made us choose Schiller as the best place to get a burger in Berlin-Friedrichshain. The prices of the Schiller Burgers are a about average compared to the other places in in Berlin. The normal hamburger starts at 5 Euro and the prices go up to 8 Euro for a burger with heaps of tasty ingredients. The small restaurant does not have the Berliner style (like Burgeramt) but is still cosy and clean. Vegetarian: Schiller Burger offers four different vegetarian burgers and two additional vegan burgers. This is more than most other burger-places in this list and we personally really liked the one with halloumi. Our Tip: Schiller Burger has homemade sauces which are delicious. Try the Honey-Mustard or the Mango-Fresh and judge yourself. A Berliner Burger-restaurant which used The Netherlands as a source of inspiration, is Rembrandt Burger. This place sells real Dutch fries, burgers with Dutch cheese and even Kroketten, Frikadellen and Kaassouffles (Famous Dutch Fast-Food). 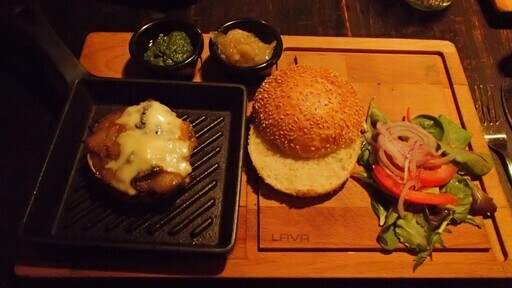 The burgers are served on top of fresh bread and you can choose between wholemeal or normal white bread. The small restaurant of Rembrandt burger is cozy and definitely offers a better atmosphere as most of the small Imbiss-places in this list. Because Rembrant Burger is a real restaurant, the burgers are a bit more expensive than most other places in this list. For 7,50€ you can order a proper burger with great meat, fresh ingredients and obviously you also pay for the service and ambiance. Rembrandt Burger is worth a visit, even if you have no special interest in The Netherlands. Vegetarian: Besides 6 different meatburgers Rembrandt Burger also offer 3 vegetarian burgers. We tried the “Veggie Steak” and it tasted great. 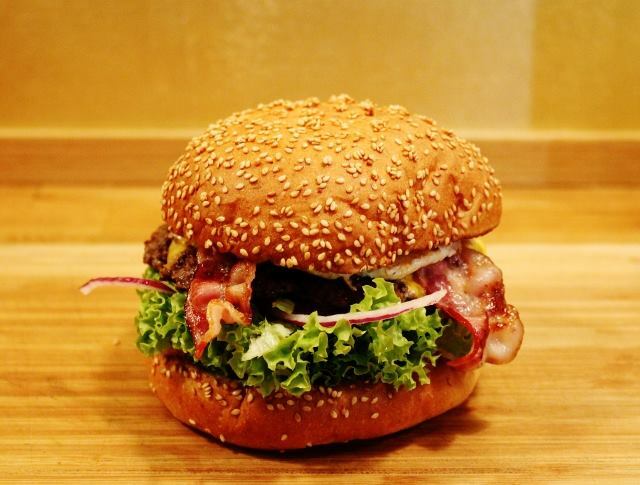 Berlin-Enjoy tip: All burgers on the menu of Rembrandt Burger can also be ordered as Mini-Burger. So if you are not that hungry after all you can still try them out. 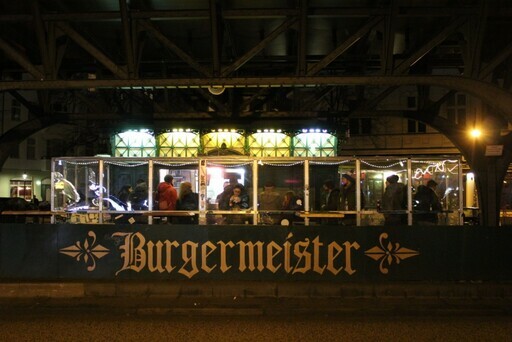 The Burgermeister is one of the most famous burger-places in Berlin. This has a lot to do with the funny name but also with the long history of the „restaurant“ which has been preparing burgers since 2006. Another great thing is that the Burgermeister is located in a old toilet-building from the 19th century. If you want to eat a burger at this place you have to get ready to stand in line for a while, even in the middle of the night there are long cues for this burger. As mentioned above, the Burgermeister has been baking burgers for more than 10 years. Since last year there is also a second branch at Kottbusser Tor but it does not have the same charm as the one at the end of the Warschauer Brucke. The burgers of Burgermeister are not as large as most other burgers in this list but they taste delicious and the prices are very reasonable. Besides that I can really recommend taking the chili-cheese-fries, which are kind of a calorie-bomb. Vegetarian: There is only one vegetarian burger on the menu of the Burgermeister. It is prepared with Tofu and not the reason why you should visit this burger-place in Berlin. 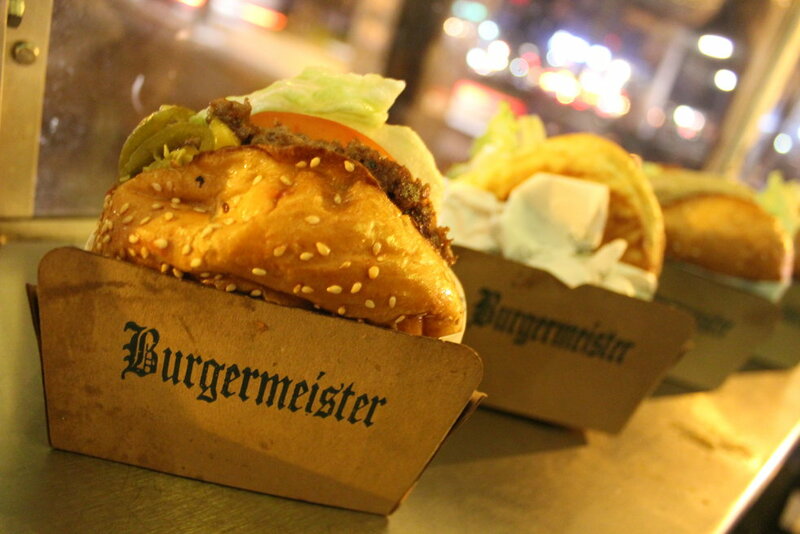 Our recommendation: The Hausmeister burger is a large and very tasty burger which you have to try if you ever pass the Burgermeister after a long night of partying. 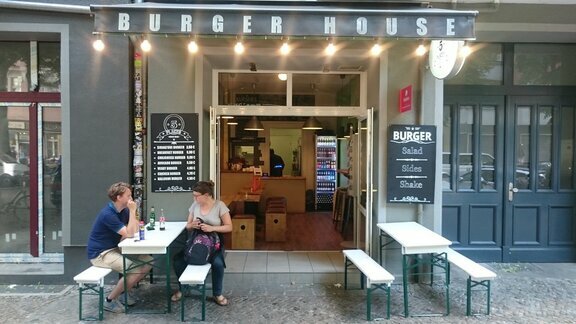 Most Burger-places in Friedrichshain are quite small and can best be addressed as „Imbiss“. Muse is different when it comes to that point: If you want to eat a burger in a nice restaurant with a cosy atmosphere you should visit this place. The interesting thing about Muse is, that you will get the ingredients of your burger served on a plate and you will have to build your burger yourself (see photo). If you want the burger medium or rare you can take it out of the pan directly, if you want it a bit more done you just have to leave it in for a bit longer. The downside of having a burger in a real restaurant is the price. Although the prices at Muse are still very reasonable you pay more than in most of the places in this list. But it all makes sense if you ask me, you will get a nicer atmosphere and good service for a few extra bucks. The burgers of Muse are very good but I was not that impressed by the normal fries to be honest, so maybe choose the sweet patatoes if you go here. Vegetarian: If you order a vegetarian Burger at Muse you get a large mushroom (Portobello). My girlfriend was very pleased with the taste and also this burger gets served like the meat burgers. Our recommendation: Besides building your burger right in front of you, you will also be able to choose the all the ingredients you want. Create your dream-burger at Muse. 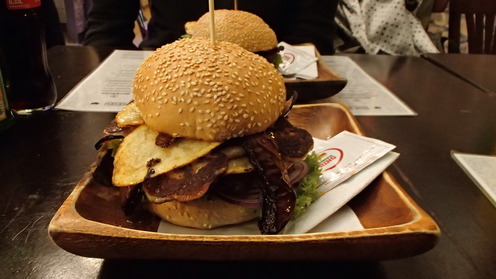 A great burger for an even better price can be found at Devil Burger in the Ebertystraße. This burger-place would have much more visitors if it would have been located at a more popular location. But if you ask me it is definitely worth a short ride to get a Devil Burger. Just travel to station Landsberger Allee and you can reach this burger-cafetaria by foot from there. There are not many burgers in Berlin which taste this good for such a low price. The normal Hamburger starts at 2,90€ and even the larger burgers can be bought for less than 7 Euros. The burgers are quite large, have fresh ingredients and the owner is one of the most friendly guys we’ve met making this article. Vegetarian: At Devil Burger you can choose between 7 different vegetarian burgers. We have tasted the one with blue cheese and it was great. Our recommendation: All burgers taste great so just choose which one ingredients you like the most. If you order a menu, make sure you choose the twisted fries. Besides Bürgermeister and Burgeramt, Kreuzburger is another place in Berlin which uses the double meaning of the word Burger. Obviously the name makes most sense in the bezirk Kreuzburg. But for this article we visited the restaurant in Friedrichshain. 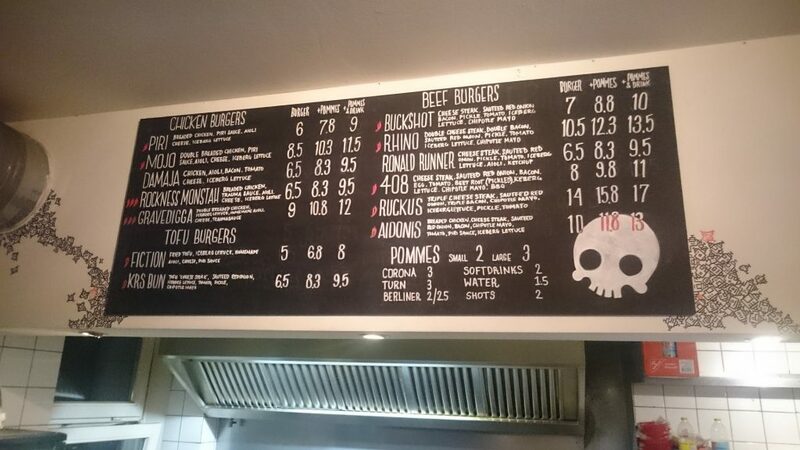 In this small burger-place you can choose between 19 different burgers and for each one you can decide if you want 100 or 180 grams of meat. 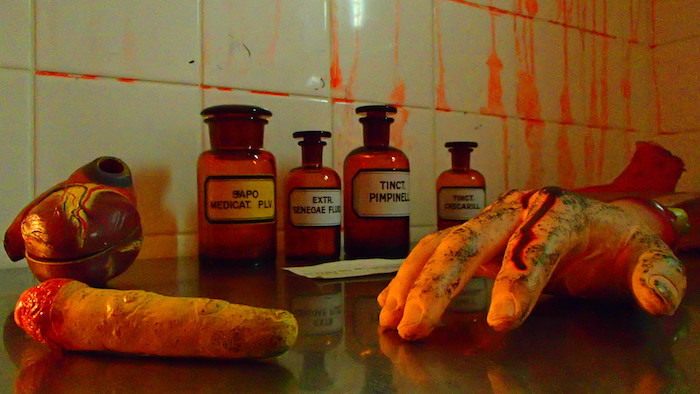 Additionally they also offer bio-meat. 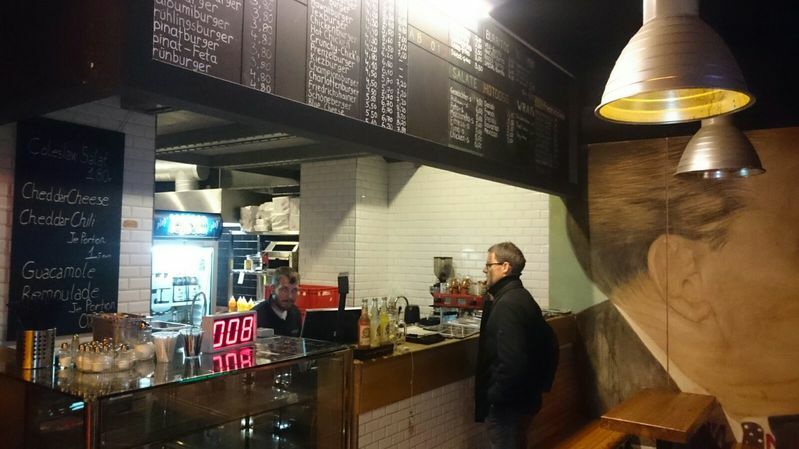 Besides hamburgers Kreuzburger also offers Burrito’s, Wraps and even Hot-Dogs. Lucky enough this does not influence the taste of their burgers: Although it cannot compete with the top 5 of this article, Kreuzburger still offers a solid burger for a reasonable price. 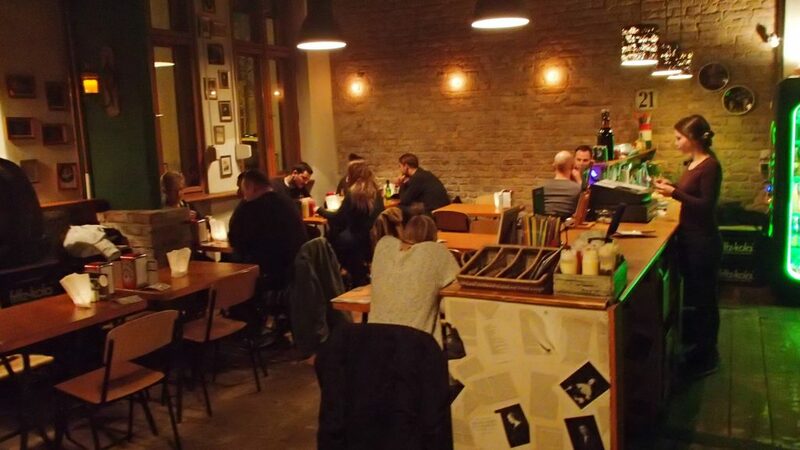 The Kreuzburger in Friedrichshain is located in the Grünberger Straße, which is a great location if you want to get a drink in a bar afterwards. Vegetarian: Kreuzburger offers several burgers for vegetarian guests. They can choose between Halloumi, Feta-Cheese, Spinach and some other ingredients. Our recommendation: Try the Burrito of Kreuzburger if you are not in the mood for a burger but your friends are forcing you to join. A Berliner burger which can be found in the Boxhagener Straße is prepared in a place called Fritiersalon. 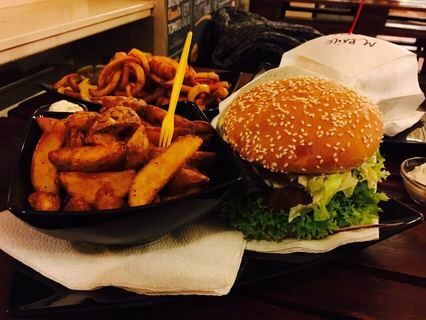 Although the burgers cannot compete with the best 5 burgers in this arrticle, they still taste great and the small restaurant is located close to the weekly market at Boxhagener Platz and a club called Suß war Gestern. The normal hamburgers of Fritiersalon start around 5 Euro and the larger burgers cost a few euro´s more. The fries can be ordered with different types of sauces and cheese on top. If you order a larger burger with fries you will have plenty of food for not more than 10 Euro. Fair enough if you ask me. 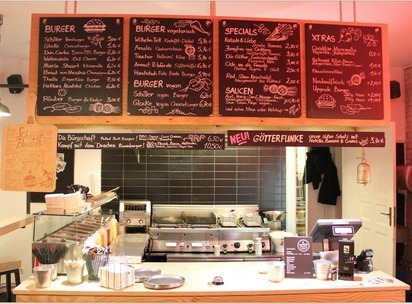 Vegetarian: As you can see on the photo above, Fritiersalon also offers vegetarian burgers. The prices can be compared to the normal burgers and the taste is good enough for a 10th place in this list. Our recommendation: The Poutine-Fries are served in the famous Canadian way and taste delicious. 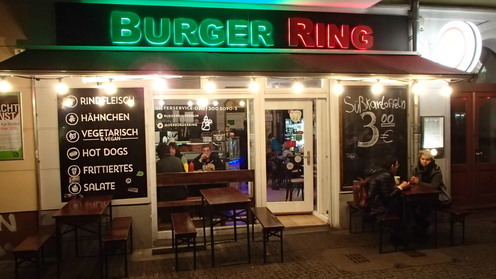 A burger in Berlin which is located at walking distance from station Ostkreuz is Burger Ring. This small Imbiss has space for about 20 people and offers many different burgers with pretty unique ingredients. I tried the Friedrichshainer-Burger, which you can see on the photo below. Definitely a proper burger which filled me up so much that I did not needed any additional fries. The prices at Burger Ring are a bit below the average of this article. The normal hamburger starts at 3,90€ and the most expensive burger (see photo) costs 7 Euro. Besides burgers you can also eat hot-dogs in Burger Ring. Vegetarian: Besides normal burgers you can order seven different vegetarian burgers at Burger Ring. The ingredients differ but the one we tasted (Halloumi) did not blow us away. Our recommendation: The Friedrichshainer is a burger with ingredients which you do not find at many other burger-places in Berlin, definitely worth a try.